Hey, we have a New Project! Here’s a very early prototype of the Cycfi Infinity Polyphonic Sustain System. 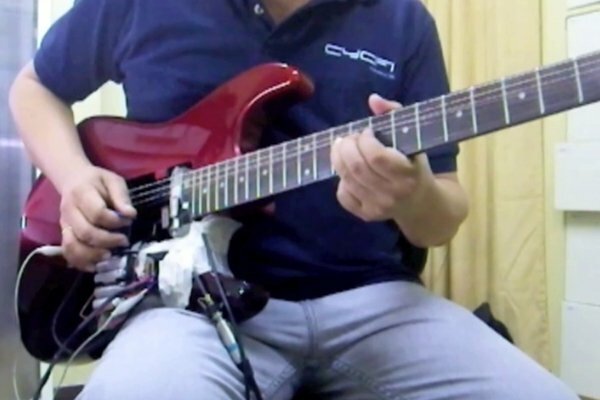 The proof of concept video above demonstrates dual sustainer drivers at the neck position with the Neo6 polyphonic pickup at the bridge. In this demo, the sustain drivers drive the two upper strings (B and E). The high, thinner strings are the most difficult to drive due to low mass and weak magnetic pull. The thicker strings are a lot easier to drive into infinite sustain. We use plain D’Addario Strings (0.009 – 0.042 super light gauge). The output of the Neo6 is summed to mono and goes to a Marshall combo with the treble set to zero, a bit of bass and mid. The amp is mic’d (Shure SM57) and recorded using Logic Pro, no guitar effect plugins, flat E.Q., a bit of reverb and a touch of delay. The strings are driven into sympathetic resonance using both hardware and software phase and frequency locking mechanisms. The drive waveform is synthesised from the polyphonic signal coming from the Neo6 pickup. The polyphonic drivers are driven at the fundamental frequency of the vibrating string with additional controlled odd and even harmonics. That’s all great and exciting! I have been using force sensitive resistors on my guitar as pads will be interesting to integrate them with your sustainer pickups.